Coal seam gas (CSG) mining is a risky, invasive form of unconventional gas mining. Coal seam gas extraction usually involves tens of thousands of gas wells, with roads, pipelines, compressor stations, wastewater dams, and other infrastructure. A CSG project can spread across hundreds of thousands of hectares of land. Download this fact sheet as a PDF. Find out about other forms of unconventional gas mining, such as Shale and Tight gas here. There have been numerous risks and problems identified with invasive CSG gasfields. These include encroachment on good farming land, disruption of other land uses and industries, clearing of bushland, air pollution, contamination or depletion of ground or surface water, pollution of waterways, health impacts on workers and nearby residents, and damage to biodiversity. The difference between conventional and unconventional gas is the geology of the reservoirs from which they are extracted and the different extraction techniques which are required to obtain commercial quantities of gas. CSG is a type of unconventional gas. It is made up primarily of methane gas (generally 95-97%) and is found in coal seams at depths of 300m-1000m underground. It is sometimes referred to as coal bed methane (CBM). What is the difference between conventional natural gas, and unconventional natural gas like CSG? The difference between conventional and unconventional gas is the geology of the reservoirs from which they are produced and the methods required to extract the gas. CSG is considered unconventional because it requires 'unconventional' methods to extract it - such as hydraulic fracturing or horizontal drilling. Other forms of unconventional gas include shale gas and tight gas. Coal seam gas is extracted by drilling a well vertically through rock strata until reaching the coal seam, at which point the well may also be drilled out horizontally to increase access to the methane gas. Coal seams contain both water and gas. During coal seam gas operations the water must be pumped out of the coal seam to lower the pressure and allow the gas to flow to the surface. There are significant concerns associated with hydraulic fracturing including the potential to contaminate water sources and cause earthquakes. A report by the Committee for Economic Development of Australia said: "In addition to concerns over contamination of aquifers from the chemicals added to fracking fluid, issues have also been raised about contamination of water supplies from fugitive gas after fracking, and seismic activity and tremors associated with the drilling and fracking process". Fracking has been used in coal seam gas operations in both Queensland and New South Wales. Watch more videos of people in Australia whose lives are impacted by coal seam gas development. BTEX is an acronym that stands for benzene, toluene, ethylbenzene, and xylenes, which are volatile organic compounds (VOCs). BTEX can be naturally occurring and benzene is a known carcinogen (cancer causing). BTEX chemicals have been used in fracking fluids used by coal seam gas companies. The use of BTEX by coal seam gas operators has been banned in both NSW and QLD. However, the process of hydraulic fracturing can release naturally occurring BTEX so it remains a risk factor during coal seam gas operations even when regulation is in place to ban gas companies using it as an additive during drilling. How much water is involved in coal seam gas exploration and production? The amount of water involved in coal seam gas operations varies from project to project. The CSIRO says: No two wells or coal seams behave identically and water production can vary from a few thousand to hundreds of thousands of litres a day, depending on the underground water pressures and geology. What is the quality of the waste water? The water extracted during coal seam gas operations is often referred to as “produced water”. This waste water is generally salty and can contain toxic and radioactive compounds and heavy metals. Once the water has been extracted from the coal seam it is stored in tanks or holding ponds at coal seam gas sites before being trucked or piped to treatment facilities. What are holding ponds and evaporation ponds? Evaporation ponds are large uncovered ponds where produced water is allowed to evaporate by sunlight. Holding ponds are large uncovered ponds where produced water is allowed to sit for long periods, but where evaporation is not a stated goal. There are numerous risks associated with open ponds of this nature, including potential for overflow during rain, inadequate lining allowing seepage of waste water into soil, and because of the large surface area that ponds take up. Although both the Queensland and NSW governments claim to have banned evaporation ponds, there are legal loopholes in each state and neither has made any attempt to ban holding ponds. How does a company get permission to conduct coal seam gas exploration or production? A CSG company must first apply to the state government for an exploration licence so that it can conduct seismic surveys and exploratory drilling to ascertain the quantity and quality of gas reserves in an area. Once an exploration licence has been approved the coal seam gas company must identify specific sites within the licence area to conduct their activities. The company must negotiate a land access agreement with the owner of the affected land, and then get approval from the state government to drill. After exploration, if the coal seam gas reserves are found to be viable for commercialization, the company may then apply to the state government for a development approval and a production licence to develop a new gasfield. What are my legal rights regarding coal seam gas exploration or production – can I refuse a coal seam gas company access to my property? Information on what you can do if you are approached by a mining company is available here. How many coal seam gas wells are operating currently? The CSG industry in Australia has expanded rapidly since 2010 - particularly in Queensland. The Queensland Government reported that there were 5127 CSG production wells in operation in mid-2016. Mapped locations of all of the CSG exploration and production wells in NSW are available here. 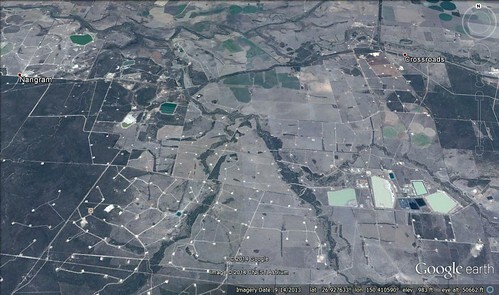 Where is coal seam gas being extracted in Australia? Most coal seam gas deposits are found in eastern Australia. There is extensive CSG production currently taking place in Queensland- from Central Queensland to the Western Darling Downs region. See this map for more detail. Since the buyback and surrender of coal seam gas licences in New South Wales, there are twelve onshore Petroleum Exploration Licences remaining - all of them in the the state's north west, from Murrurundi and Gulgong to the Queensland border and as far west as Coonamble. There is currently a ban on all forms of unconventional gas exploration in place in Victoria. In other parts of Australia, shale gas and tight sandstone gas are the main types of unconventional gas being targeted. For more information about the impacts of shale and tight gas check out this fact sheet.